When the UK leaves the European Single Market, financial firms domiciled in the City of London will lose their ‘passporting rights’. This means that many UK-based banks and other financial institutions will need to relocate a significant portion of their operations, capital and staff to alternative financial centres inside the EU. Frankfurt has consistently been identified as one of the potential beneficiaries of this process, alongside Dublin, Paris and Luxembourg. A new SPERI policy briefing published today presents new findings that show how actors within Frankfurt have responded to the Brexit vote. In November 2017 Dr Scott Lavery and Davide Schmid conducted extensive interviews with a broad range of elite stakeholders based within Frankfurt’s financial sector. They interviewed Frankfurt-based trade associations, international banks, regional banks, regulatory bodies, marketing agencies, international financial institutions and representatives of the Hesse region. 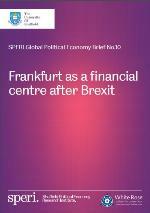 The new SPERI brief shows how influential political and financial organisations in Frankfurt are working together to promote the city to financial service firms. Key stakeholders in Frankfurt acknowledge that the City of London will remain Europe’s primary financial hub after Brexit – but they expect between 5,000 – 10,000 jobs to move to Frankfurt over the next four years. Frankfurt has ‘played to its strengths’ by focussing on the political and economic stability of Germany and the competence of its regulatory authorities. The brief outlines how Frankfurt has not taken the more ‘aggressive’ approach pursued by other rival EU financial centres, most notably Paris and Luxembourg.